Master Bedroom 1 (2nd Floor): King size bed, deluxe pillow top mattress, 42 inch TV, full bath, walk in shower, free standing tub, walk in closet. Master Bedroom 2 (3rd Floor): King size bed, deluxe pillow top mattress, 42 inch TV, full bath, walk in shower, large walk in closet. Large Bedroom 3 (1st Floor): 2 Queen size beds, deluxe pillow top mattresses, 42 inch TV, full bath, walk in shower, walk in closet with sliding barn door. Private deck facing wooded back yard with Adirondack chairs. Bedroom 4 (1st Floor): Bunk Bedroom with 6 beds – 4 bunk beds and 2 trundles. 42 inch TV, full bath, shower / tub combo, closet. One of the largest top floor entertainment decks in all of Seacrest! 4 ceiling speakers hard wired to SONOS WIFI music streaming system. Stream music wirelessly from your phone. TV and Dining seating areas. Adjacent bar with sink, refrigerator and full size ice maker and TV. THE BEST / MOST CONVENIENT location in Seacrest. Centrally located and short walks to EVERYTHING! – 1 minute walk to 12,000 sq ft Seacrest pool complex. 4 homes away. – 4 minute walk to Seacrest town square. Great shopping and dining. – 8 minute walk to Seacrest Beach. Free tram rides also available. – 2 full size commercial ice makers. – SONOS WIFI system enables wireless music streaming from your iPhone to 4 speakers on top floor 1100 sq ft entertainment deck. – Stainless steel Fridgedair refrigerator, dishasher, range / oven, full size icemaker and microwave. – Cable TV and Wifi throughout. 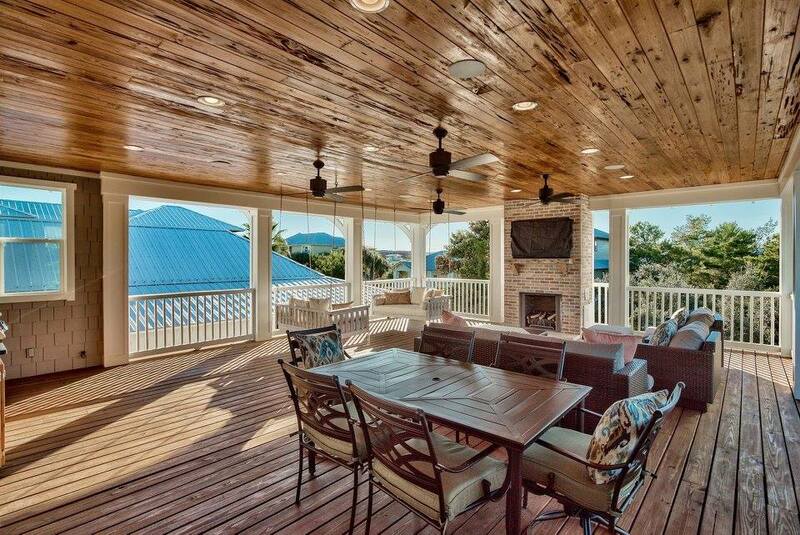 – 2nd floor large deck outside of great room / kitchen – with 2 ceiling fans, adirondack chairs, Green Egg Grill and Gas Grill. – 1st floor large deck outside of 2 Queen Bedroom with adirondack chairs.